For Super Fine finishing for all metals. Very fine buffing to give a shine for all metals. For tender metals like copper, brass, etc. and plastic. Inital polish for erasing marks and scratches on all metals. For very hard steel, chrome, cobalt, etc. Green rouge is for a high luster on hard metals such as chrome, stainless steel and platinum. This is a 1/4 pound bar. No finer compound exits for producing the final wonderous color and luster on gold and silver. A one pound bar. Green rouge is for a high luster on hard metals such as chrome, stainless steel and platinum. Now available in a push up tube. 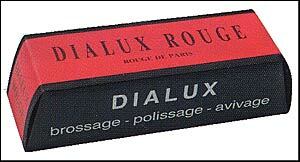 Just pull the top off and push the needed amount of rouge to be used. There is no more need to hold the rouge with your bare hands, only to have the rouge rub off all over your skin. This new product is a quick, easy, and clean way of polishing. Approximate weight is 3.25 oz. 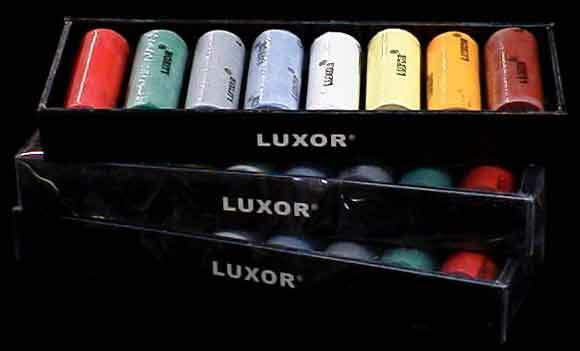 Red Rouge is for prducing the final high color and luster on gold, silver, and other soft metals. 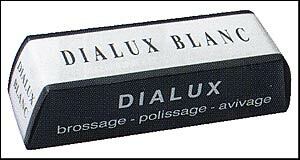 White rouge is a quick Polishing compund for hard metals such as stainless steel, chrome or platinum. Yellow Rouge is for hard metals such as platinum, chrome, and stainless steel. Leaves little residue on work. One Step is the final touch for finishing metals and plastics. Removes scarches and leaves a high finish. 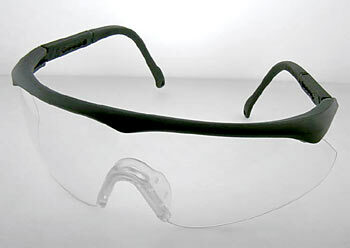 Clean and greaseless with no discoloration. Provides high-luster finish on all types of precious and decorative metals. Special formulation removes light scratches and produces a fast, mirror-bright final finish without discoloration. Greaseless, dry but not dusty, which means fast and easy clean-up with little or no residue. Always use a different buff for different rouges and never mix them. Made of fine muslin with combed edges, the centers are shellac-hardened. These 3-inch buffs have 35 plies and 3 rows of stitching. This 4-inch buff has 50 plies and 4 rows of stitching. These 5-inch buffs have 55 plies and 5 rows of stitching. These 6-inch buffs have 60 plies and 6 rows of stitching. Bergeon Diamantine powder are of high quality and packaged in containers of 15 grams. Larger sizes are available upon request. This is the world's best selling general purpose cloth to wipe off dust and finger prints. Used, sold and given away by fine jewelers all other the world you can wash this cloth when soiled. 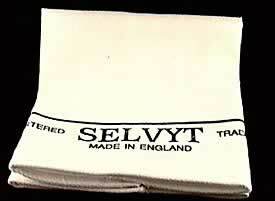 The Selvyt Cloths are old and very traditional cloth that have been the leading seller in the jewelry industry. It replaced chamois leather as the most popular cloth In use. 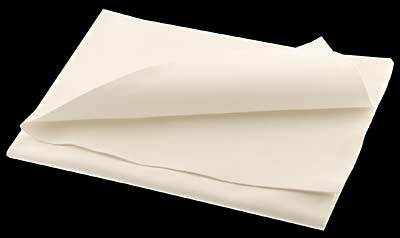 While in fact good chamois leather has some superior qualities the durability and ease of washing clean the Selvyt cloth along with the multiple uses jewelers and watchmakers found for them made the Selvyt cloth and indispensable item for all. Even today with new Mirco-fiber on the market which have some superior qualities that the Selvyt cloths multiple uses and lasting durability still have a place in the workshop. 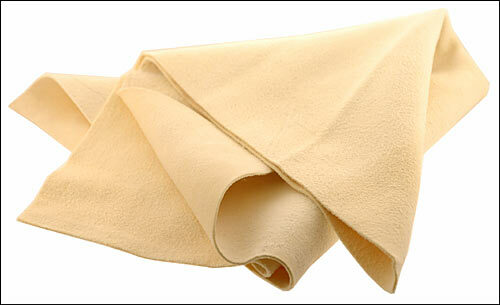 Chamois Leather Cloth 11 1/2" x 11 1/2"
Great for polishing and cleaning. 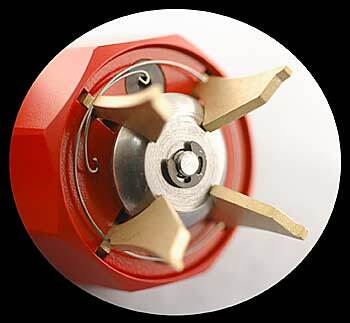 This is what the pros use and scratches on plastic crystals are removed in seconds, when it is applied to a buffing wheel and lightly buff. Extreme care must be used and if you have an emotional attachment to the watch, then this is not a product for you. 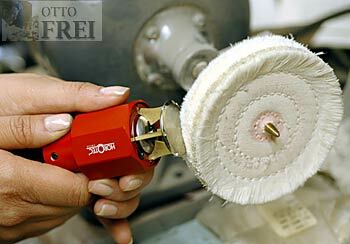 Only use on a bench top buffing wheel and with the crystal still in the case using two hands gently place in front on the outer hairs of the fast spinning buffing wheel for just a few seconds. Too much pressure and you will burn a hole in the crystal this also only takes a second to happen. If is not advised to use a Dremel type hand tool, since all it takes is one slip and the crystal is destroyed. Safely and easily removes fingerprints and smudges from all glass and plastic crystals. Move over Selvyt Cloth, Micro-Fiber Cloths are ready to be the new king of the hill. 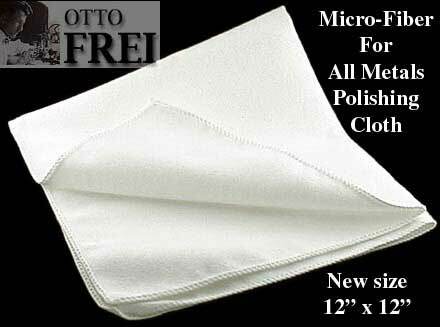 Use this white micro-fiber cloth on any metal you will be impressed with the results and Selvyt cloths might someday soon be looked at the way the Model-T Car is now. 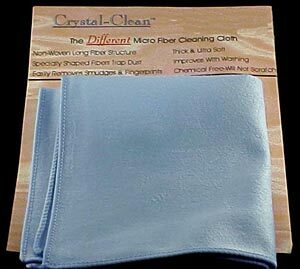 Polishing and cleaning tasks, which before you might use a rouge cloth on can now be done with this clean white micro-fiber cloth. You really have to give one of these cloths a try. New 12" x 12" size is offers 20% more polishing surface, than the 10" x 10" cloth. 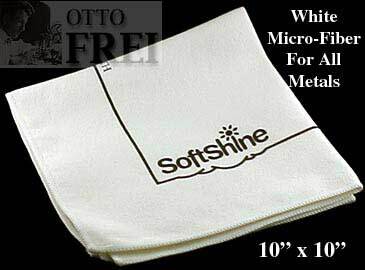 Micro Fabric Cloth 10" x 10"
Large size cloth measuring at 330 x 330 mm, giving you more surface area to work with. Made of 70% polyester and 30% polyamide. High quality, abrasive rubber wheel. 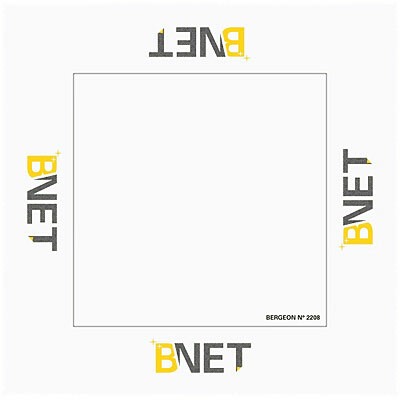 Widely used in the fields of jewelery making, watch and clock making, optics and surgical instrument manufacturing. Maximum working speed is 3800 rpm. 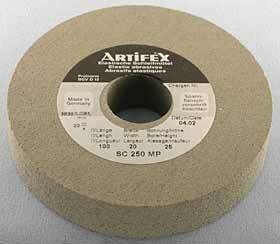 Medium grit 80, buff diameter 100mm, width 25mm, hole diameter 13mm. 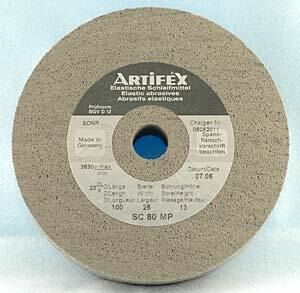 Fine grit 250, buff diameter 100mm, width 20mm, hole diameter 25mm. 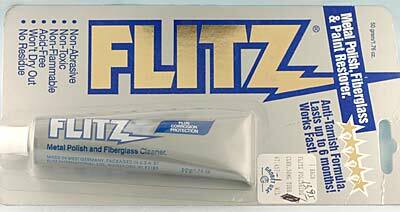 Metal polish, fiberglass and paint restorer. Anti-Tarnish Formula that works fast. 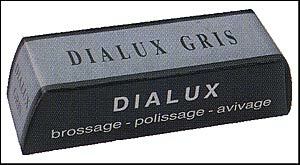 Non-abrasive, non-toxic, non-flammable, acid-free, won't dry out, and no residue. Contains 50 grams/1.76 ounces. This product protects areas on your item that you do not want to be affected while polishing, buffing, or finishing. 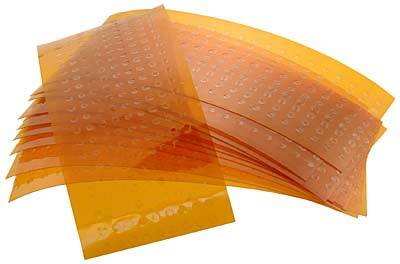 Contains 240 pieces of 2 mm wide dots on one single sheet. Heat resistance and leaves no residue behind. Sold as one sheet. This product protects areas on your item that you do not want to be affected while polishing, buffing, or finishing. Very thin and 2 mm wide. Heat resistance and leaves no residue behind. This product protects areas on your item that you do not want to be affected while polishing, buffing, or finishing. Very thin and 3 mm wide. Heat resistance and leaves no residue behind. This product protects areas on your item that you do not want to be affected while polishing, buffing, or finishing. Very thin and 4 mm wide. Heat resistance and leaves no residue behind. This product protects areas on your item that you do not want to be affected while polishing, buffing, or finishing. Very thin and 5 mm wide. Heat resistance and leaves no residue behind. This product protects areas on your item that you do not want to be affected while polishing, buffing, or finishing. Very thin and 6 mm wide. Heat resistance and leaves no residue behind. This product protects areas on your item that you do not want to be affected while polishing, buffing, or finishing. Very thin and 7 mm wide. Heat resistance and leaves no residue behind. This product protects areas on your item that you do not want to be affected while polishing, buffing, or finishing. Very thin and 8 mm wide. Heat resistance and leaves no residue behind. This product protects areas on your item that you do not want to be affected while polishing, buffing, or finishing. Very thin and 9 mm wide. Heat resistance and leaves no residue behind. This product protects areas on your item that you do not want to be affected while polishing, buffing, or finishing. 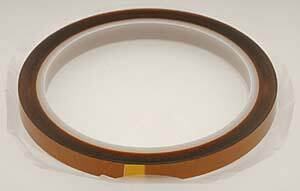 Very thin and 10 mm wide. Heat resistance and leaves no residue behind. This product protects areas on your item that you do not want to be affected while polishing, buffing, or finishing. Very thin and 11 mm wide. Heat resistance and leaves no residue behind. This product protects areas on your item that you do not want to be affected while polishing, buffing, or finishing. Very thin and 12 mm wide. Heat resistance and leaves no residue behind. This is a white protective lacquer based on aqueous polymers; to be used to protect certain parts of jewelries, watch cases, bracelets or other metals during polishing, engraving, thinning, etc. Apply in uniform layers with a paintbrush and let dry before use. 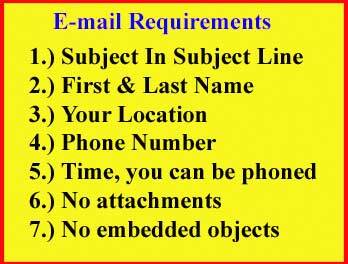 Easily removable with or without water. This polishing tool is used for finishing watch cases, bezels, rings, case backs and more. 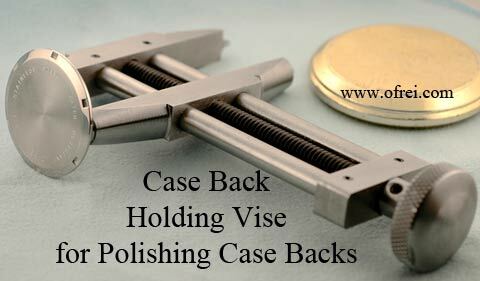 Equipped with 4 brass jaws that opens from 25 mm to 50 mm in diameter to handle larger case backs. Manual Use: Attach item to polish onto the jaws. Hold tool on one hand and polish piece with a cleaning cloth with the other without ever touching the item. Gently lay down the item onto a clean cloth and loosen the jaws to release the piece. Motor Use: Attach item to polish onto the jaws. 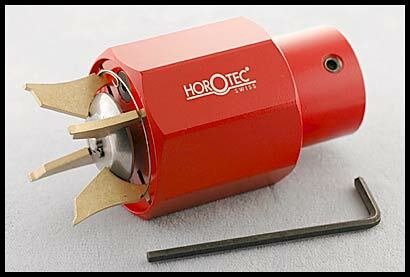 Fix the tool onto a 13.90 mm polishing motor arbor and tighten it with 2 screws using the provided hexagonal key. Make sure all parts are safely tighten before turning on the machine. While motor is spinning, apply buff or cleaning cloth gently onto the piece to polish as desired.